This medication is used to prevent gout and gouty arthritis. It will not treat a sudden/severe attack of gout and may make it worse. Probenecid belongs to a class of drugs known as uricosurics. It lowers high levels of uric acid in your body by helping the kidneys to get rid of uric acid. When uric acid levels get too high, crystals can form in the joints, causing gout. Lowering uric acid levels may also help your kidneys. Probenecid may be prescribed in combination with certain antibiotics (such as penicillins). It increases the levels of antibiotic in the blood, which helps the antibiotic work better. Probenecid should not be used in children younger than 2 years. To prevent gout, take this medication by mouth, usually twice daily with food or antacids to reduce stomach upset or as directed by your doctor. It is best to drink a full glass of water with each dose and at least another 8 glasses (8 ounces each) a day while taking this drug in order to prevent kidney stones. If you are on restricted fluid intake, consult your doctor for further instructions. Your doctor may also instruct you on how to decrease acidity in your urine (e.g., avoid large amounts of ascorbic acid/vitamin C) to prevent kidney stones. Your doctor may order other medications (e.g., sodium bicarbonate, citrate) to make your urine less acidic. Dosage is based on your condition and response to therapy. Your doctor may direct you to take a low dose at first, then adjust your dose based on uric acid levels and your gout symptoms. After you have been symptom-free for several months and your uric acid levels are normal, your doctor may lower your probenecid dose to the lowest effective dose. Follow your doctor's directions carefully. Probenecid should not be started during a sudden/severe gout attack. Wait until your current attack is over before starting this medication. You may experience an increase in the number of gout attacks for several months after starting this medicine while the body removes extra uric acid. If you have a gout attack while taking probenecid, continue taking it along with your medications for gout pain. Probenecid is not a pain reliever. To relieve pain from gout, continue to take your medicines prescribed for pain from gout attacks (e.g., colchicine, ibuprofen, indomethacin) as directed by your doctor. If you are taking this medication to raise the level of antibiotics in your body, follow your doctor's directions for when to take the antibiotic and when to take the probenecid. What conditions does Probenecid treat? Nausea, loss of appetite, dizziness, vomiting, headache, sore gums, or frequent urination may occur as your body adjusts to the medicine. If any of these effects persist or worsen, tell your doctor or pharmacist promptly. Tell your doctor right away if any of these unlikely but serious side effects occur: lower back pain, difficult/painful urination, change in amount/color of urine. Tell your doctor right away if any of these rare but very serious side effects occur: easy bruising/bleeding, signs of infection (e.g., fever, sore throat), severe abdominal pain, pale stools, unusual tiredness, dark urine, yellowing eyes/skin. List Probenecid side effects by likelihood and severity. Before taking probenecid, tell your doctor or pharmacist if you are allergic to it; or if you have any other allergies. This product may contain inactive ingredients, which can cause allergic reactions or other problems. Talk to your pharmacist for more details. This medication should not be used if you have certain medical conditions. Before using this medicine, consult your doctor or pharmacist if you have: low blood counts (e.g., aplastic anemia, bone marrow depression), certain type of kidney stone (uric acid). Before using this medication, tell your doctor or pharmacist your medical history, especially of: cancer treatment, a certain enzyme deficiency (G6PD), kidney problems (e.g., kidney stones, obstruction), peptic ulcer disease. Kidney function declines as you grow older. This medication is removed by the kidneys. Therefore, elderly people may be at greater risk for side effects while using this drug, including stomach problems. What should I know regarding pregnancy, nursing and administering Probenecid to children or the elderly? Some products that may interact with this drug include: cancer chemotherapy, ketorolac, dyphylline, methotrexate, pyrazinamide, salicylates (e.g., high-dose aspirin), zidovudine, certain drugs removed from your body by the kidneys (such as ceftazidime/avibactam, dapsone, heparin, fosfomycin). Alcohol can decrease this drug's effectiveness. Limit alcohol while taking this medication. This medication may interfere with certain laboratory tests (including urine glucose tests), possibly causing false test results. Make sure laboratory personnel and all your doctors know you use this drug. Does Probenecid interact with other medications? If someone has overdosed and has serious symptoms such as passing out or trouble breathing, call 911. Otherwise, call a poison control center right away. US residents can call their local poison control center at 1-800-222-1222. Canada residents can call a provincial poison control center. Symptoms of overdose may include: severe vomiting, loss of consciousness, seizures. If you are using this medication to treat gout, your doctor may recommend a low-purine diet. Follow your doctor's instructions carefully. 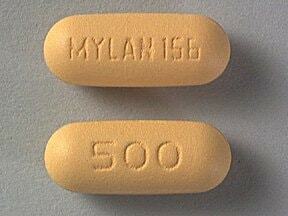 This medicine is a yellow, oblong, film-coated, tablet imprinted with "MYLAN 156" and "500". 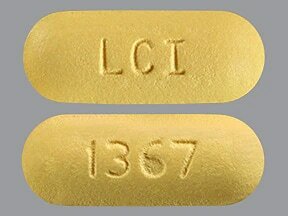 This medicine is a yellow, oblong, film-coated, tablet imprinted with "LCI" and "1367". 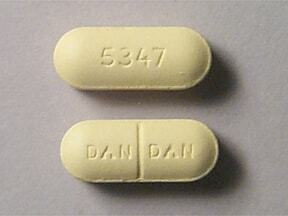 This medicine is a yellow, oblong, scored, film-coated, tablet imprinted with "DAN DAN" and "5347". Are you considering switching to Probenecid? How long have you been taking Probenecid?